Scary shot of a spooky mad clown making frightening faces in dark room under stroboscope. Portrait. hd00:19Scary shot of a spooky mad clown making frightening faces in dark room under stroboscope. Portrait. hd00:19Scary clown with an axe in a dark room. Frightening jester, clown, buffoon. hd00:20Evil, horror clown man looking into camera. hd00:26Scary clown uglify his make up. Horror, spooky clown. hd00:18A clown juggles red apples and shows his teeth. hd00:22Hands take evil scary clown into the hell. 4k00:09Scary monster turning to camera, winking. Halloween face art, man with colored zombie makeup on black background. hd00:19Scary clown making frightening faces. Close-up. hd00:21A clown makes face cutting movements with an axe. hd00:09Scary clown with a chainsaw in the dark. Clown murderer threatening you. hd00:10A top view of a clown shouting on a swing. hd00:10A clown rides low children swings in the dark. 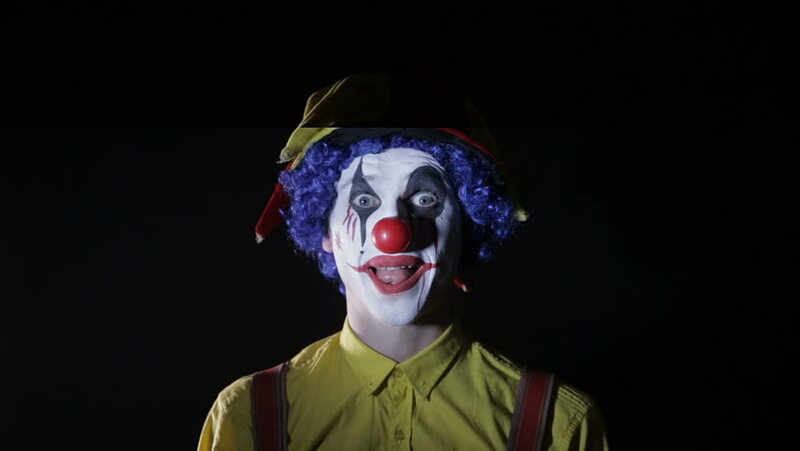 hd00:07Sad scary clown riding on unicycles in a dark street. hd00:22A scary clown makes fast head and torso movements.